Owned and operated by Joel Nunnikhoven, 1st Class Auto Body is Bellingham’s newest collision repair facility. Showcasing state-of-the-art equipment and tooling, a passion for excellence and quality workmanship, our technicians bring 80 years of combined industry experience. Highly trained and certified, technicians receive ongoing training with I-Car. We are proud to be endorsed by original equipment manufacturers, and our repairs always abide by the standards they mandate. We look forward to serving the Bellingham community and getting your car back to first class condition! We welcome all makes and models and accept all insurance carriers. Our staff is I-Car trained, so there’s no repair we can’t handle. Our staff uses state-of-the-art equipment and we offer a lifetime warranty on all our work, ensuring perfect results for every repair. 1st Class Auto Body has worked on my cars and trucks for sometime now and he is a true perfectionist!! His customer service is as first class as he is. Top notch customer service! And high quality workmanship! 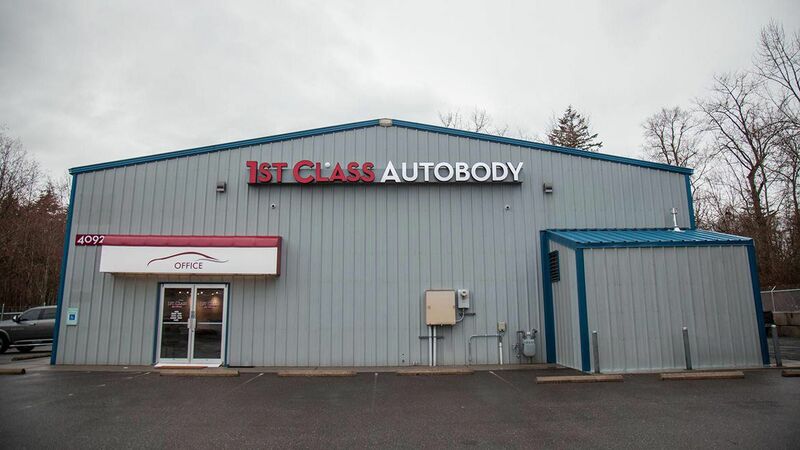 1st Class Auto Body has repaired and detailed our cars flawlessly over the years! 100% hands down the best place to go for quality work and great customer service! I have worked with Joel for over 10 years with multiple personal and fleet vehicles and have had nothing but the best in service an quality. Joel you are "1st CLASS" a very appropriate name for your new company. We wish you the very best in your new venture. We believe that having a neat work space allows us to repair cars as quickly and efficiently as possible. A combination of high quality materials, tools, and highly trained staff gives us an edge over the competition. We use state of the art equipment and tooling to properly and safely repair all makes and models. Our skilled staff is I-Car trained and their attention to detail is unmatched. We want to make sure that your experience with us is first class. Our waiting area is comfortable and welcoming.